I thought I’d be sad and sentimental about the prospect of Sears’ demise. It’s not happening. I’ve been trying and failing to bring to mind good memories. But the most interesting things about Sears, the groundbreaking catalog and the mail-order house kits and all that, were before my time. In my time, Sears was dull as ditchwater. Maybe I’m just not enough of a shopper. The company had its chance with me. Sears owned the only good-sized stores in almost every neighborhood I’ve lived in. But all the kids I grew up with detested Sears, where our parents could easily find us the Most Boring Clothes on Earth. They might as well have called the stores Sears, Roebuck and Corduroy. A Sears store was the first big store I went to on my own, when I was 8 or so. Before that, I had occasionally bought candy at Chicago corner stores, and after we moved to Niles, I walked once a week to Sullivan’s bar on Milwaukee Avenue to pick up my mother’s carton of Parliaments. That was it for my shopping career. Further up Milwaukee from Sullivan’s, a mile from our apartment, was the relatively new Golf Mill Shopping Center, where the big Sears store was. I had been planning for months to make my first Sears purchase. The store had advertised that once a week, it would sell a different glue-together model of the monsters featured in Universal Pictures. This was a very big deal in my peer group, which considered them not souvenir models, but role models. I marked on the calendar the day I would go to buy the “Gill-man” featured in the “Creature from the Black Lagoon” movies. I was fascinated by reptiles and amphibians, and here was a giant reptile that walked like a man, and ruthlessly murdered humans who interfered in his way of life. And for 99 cents! The last day of the sale, I went to school, so juiced with anticipation that I could barely think. I finished my chores — kids did chores then — and took off walking to Sears, about an hour before closing time. It was hot. Stinkin’ hot. In those days, air-conditioning was still something of a luxury, so we were used to discomfort. It went along with the corduroy. So if I remember all these years later how hot it was, it must have been like the surface of the sun out there. And I do remember. I walked, dripping in sweat, into the air-conditioned store. I didn’t care how weird that felt. I was on a mission. A Gill-man stood on a counter, all glued together and attached to a metal stand. He was almost a foot tall. He was magnificent. “I’d like to buy one of those,” I told the lady, as I dripped onto the carpet. “Buy what?” she asked. “What do you want?” Her voice came down from far above my tiny self. “The Creature,” I said, nodding toward the Gill-man, suddenly embarrassed that I wanted a toy, and not a tie or a fedora or something else that Real Men would shop for. “What creature?” she demanded, though she was standing so close to the display that she had to be careful not to knock it over. This went on for a while. You can imagine. I was stunned. I had forgotten about the sales tax. But wasn’t sales tax a penny? Obviously not. “Little boy. Don’t you know what sales tax is?” giant lady asked. “I forgot. All I have is a dollar.” I was thinking to myself that someone so little and cash-poor should have immunity from sales taxes. The cashier, however, was a loyal agent of the state. A sudden inspiration: “Could you hold one until tomorrow when I can bring another penny?” I asked. She smiled evilly. I got the distinct impression she wanted me to beg. Kids didn’t ask strangers for money in those days. Instead, they walked home in the stinkin’ hot heat to be asked by their sisters why they hadn’t just waded in and fished a penny from the mill, the pond with a water wheel near the other side of the store. Golf Mill’s mill pond was usually well-stocked with coins thrown in by people who thought, inaccurately, that it was a wishing well. I always left that pond alone, including the time, not long after the Gill-man fiasco, some of the older boys invited me to join in a plot to cleanse it of all its coins. Without me, they attacked it at speed, carrying shovels on bicycles, in a blitzkrieg of daylight burglary. Unfortunately, they could not leave as fast as they arrived, and found themselves apprehended by security guards, a subspecies of law enforcement which they never noticed before. A few years later, I found myself once again at the mercy of a Sears employee, this time at the State Street store. I had that opportunity because Sears, ahead of its time, had the truly brilliant idea of selling tickets to a variety of events at their stores. But unlike the manner in which such an initiative might be accomplished now, in those days, you merely ordered the tickets at a counter, and they arrived by mail. This I attempted to do, but only once. I will try to recreate the conversation from 50 years ago. It will be no more than 75 percent inaccurate. “I’d like to buy a couple of White Sox tickets for May 23,” I said. “Don’t you mean Cubs tickets?” she asked. About 10 years later, someone told me it would be a good idea to apply for a job writing for the Sears catalog. I found the idea somewhat appalling, but I went through the motions. I was immediately sorry, because the application demanded the kind of dedication otherwise reserved for the ACT test or the 1040 form. One requirement was to write a catalog offer for a paperclip. I got a little obsessed with that, and drew an accompanying cartoon of a paperclip that looked like something you might have seen much later, jumping around annoyingly on a computer screen. But they liked it, and made me one of five finalists. I know there were five, because they invited us all to a morning of examination and indoctrination. They assigned one person to each of us, to answer our questions as we went along. I don’t remember anything that went on all morning, but I do remember lunch. I made the mistake of sitting next to someone other than my personal minder. I noticed that all the Sears people now looked like Titanic passengers who couldn’t find lifeboats. And the weirdest thing happened. One of them denied that there was anything amiss, and insisted that everybody should sit wherever they wanted to. But as lunch progressed, three of the minders asked a barrage of similar questions of the applicants next to them, one of them tried desperately to talk across the table to the person I had displaced, and nobody talked to me at all. That gave me plenty of time to watch everything unfold, and ponder my destiny. “I’m lucky I sat in the wrong chair,” I thought to myself. Sears has for years come and gone with good ideas and questionable timing. It gave up on the ticket idea quickly, and made a deal with Ticketron to set up shop in the stores. Sears also shut down its famous, voluminous catalog in 1993, leaving it vulnerable to Amazon a few years later, instead of making Amazon impossible. 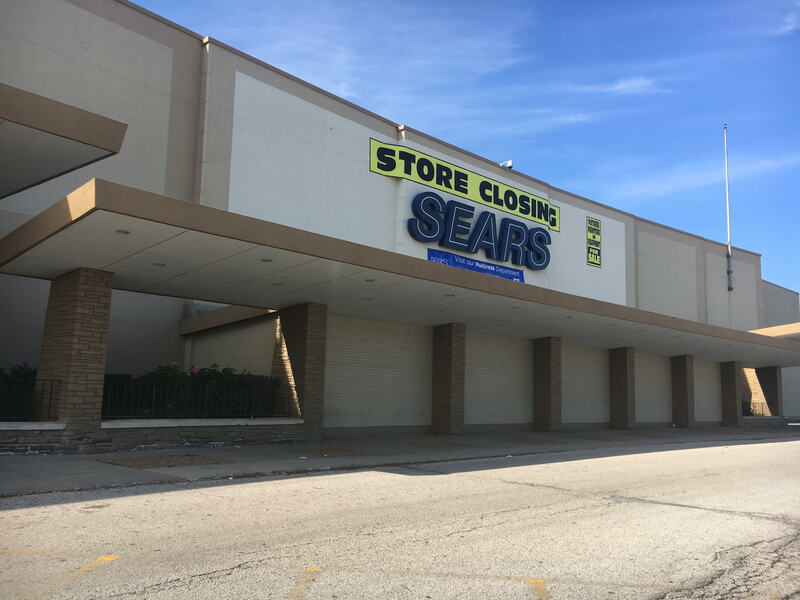 Many other Sears innovations came and went either too early or too late, such as mall-building, hardware stores, repair facilities, credit cards, rental cars, insurance. Most of the cool stuff was spun off or sold. If it had all stayed together, Sears might now be the biggest corporation in the world. Or it would have gone bust years ago. Hard to say. In 2002, Sears bought Land’s End, and spun it off in 2014. In between, the clothing retailer was inserted in Sears stores, attracting customers who had lost interest in Sears years ago. Among those returning customers was my late wife. She and I used to shop at Sears, which really meant that she bought stuff, and I browsed the Craftsman section. When our daughter was little, we took her to our regular Sears store, the same one on Lawrence Avenue at Wolcott that my parents took my sister and I to when we were kids. On my daughter’s first trip to the store, she tripped on the escalator. It sliced four perfectly even cuts into her shin, which caused more fright than damage. A nice customer service guy gave me a first-aid kit to bandage her up. After that, whenever Helen wanted to go to the Sears, the kid and I would go across the street to the McPherson School playground. They used to have a good slide and monkey bars there. And we liked to crawl under the apparatus, and pretend we were working at McDonald’s, piloting a ship, or checking inmates in and out of jail. So I was wrong. I do have good memories of Sears.